Microflow or nanoflow chromatography has been used mostly in the academic and fundamental research environment in the past for its various advantages over analytical liquid chromatography, but rarely in the industrial settings. This is most likely because many of us believe it is a pain-in-the-neck technique to perform! But is this a reality or just a perception? When I was in graduate school 10+ years ago, I had to quantitate nucleotide adducts in complex biomatrices at very low concentrations with a limited amount of sample (amol level in human hepatocytes). The 2.1-mm and 4.6-mm ID columns are definitely not the best choices for this task, so I had to pack my own capillary columns, deal with the fused silica tubing, and fumble through a lot of small parts and fussy connectors in order to “enjoy” the sensitivity benefit of the low flow LC/MS. I used to set up the column packing process after lunch and constantly check the progress for hours. If nothing went sideways (did I mention it took me six years to finish grad school? ), I could pack two columns a day. If I was extremely lucky that week, one out of five columns would work (sort of!). If I was having a not-so-great week, my record was one out of 12! These experiences were the most painful among all the agonies I had to deal with in grad school! As we all know, fused silica is super “delicate”: cutting it right is an art, and connecting it properly requires stable hands and tremendous patience. Making a usable column and setting up a well-functioning nano- or microflow system were actually just a small part of the sob story (Figure 1). The biggest problem I encountered was having good reproducibility from one setup to another. It was nearly impossible due to the many variables introduced during the column packing and installation processes. I could keep going on and on about the capillary chromatography nightmare in my grad school days — but it doesn’t matter anymore (hey, I graduated!). The question is — do scientists still need to go through this type of difficulty when they are desperate for sensitivity? The answer is no (yay!). In recent years, there have been great improvements in microfluidic LC/MS created by various vendors. The integrated nano or microflow LC/MS has the biggest positive impact on alleviating the sore spots of the microflow technique. For example, the ionKey/MS system (Figure 2) incorporates the liquid chromatographic separation as a part of the mass spectrometer’s ESI source. 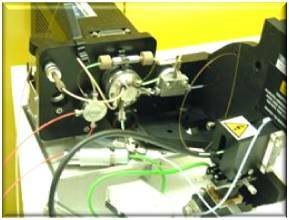 Here, all of the essential connections are made when a key-like device, the iKey Separation Device, is directly inserted into the MS ion source. The iKey is a micro-channel LC column that combines all the electrical connections, heating control, nebulization gas inlet, and the ESI emitter (Figure 3). With this fully integrated separation device, all you need to do is to plug it into the source and lock it in place by turning a knob (Figure 4). Figure 2. The ionKey/MS System and its iKey Separation Device. Figure 3. Connections embedded in the iKey Separation Device. Figure 4. Plug-and-play design of the ionKey/MS System. The iKey is a plug-and-play tile-based separation device. As part of the mass spectrometer ion source, it alleviates the fragile fused silica column and its leakage due to finicky connections or cracked fused silica. There is minimal manipulation of the connections within the system. It provides great system robustness and reproducibility (Figure 5), and reduces dead volume between the outlet of the column and MS source, which effectively minimizes the peak dispersion. Figure 5. Data showing the robustness and reproducibility over 1000 injections on an ionKey/MS system with one iKey Separation Device. We all know that nano-to-microflow LC/MS is mainly used for proteomics. However, is it the only field currently that benefits from the improvement of microflow technology? Is its sensitivity gain universally recognized as an advantage for different molecules or applications, or just proteins? We will also explore the answers of these questions in my future posts. Stay tuned!